Hello fall and hello pumpkin spice lattes! Do you love fall flavors in your morning cup o' joe but hate spending the money?? Well, you're in the right place! 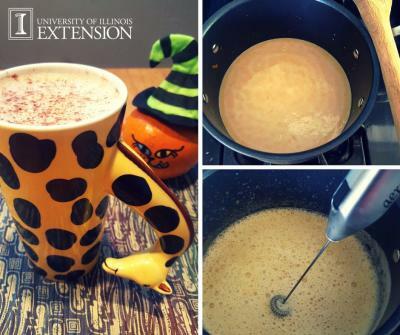 Instead of driving to the coffee shop, waiting in line, and spending more than necessary…you can make your own pumpkin spice latte (PSL) quickly at home for only $1 and half the calories, fat and sugar! Since we'll be using real pumpkin instead of pumpkin syrup, you'll be getting some fiber and Vitamin A as well. In a sauce pan, add the milk, honey and pumpkin. Cook on medium until hot but not boiling. Remove from heat and stir in the coffee, pie spice and vanilla if using then pour into your favorite mug.Top with additional cinnamon. If you have a frother, aerate your drink for extra foam. It can also be pulsed in a small blender. Nutrition Facts Face-Off. Look at these savings!